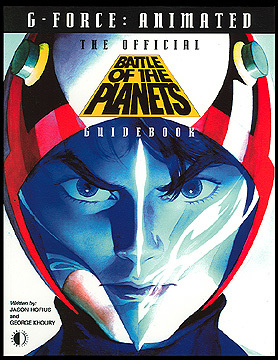 Information: The first book completely about the history and production of Battle of the Planets in the US and abroad. This 96 page volume by Jason Hofius and George Khoury detailed the histories of both Gatchaman and Battle of the Planets. It contained exclusive interviews with both Japanese and American production personnel including Ippei Kuri, Sadao Miyamoto, Sandy Frank, Casey Kasem, Jameson Brewer, Janet Waldo, Ronnie Schell, Hoyt Curtin and more. It also contained many rare photos, plus looks at Battle of the Planets' music, merchandise, characters and episodes. Though listed as full-color in advance advertisements, a number of black and white segments were present. The book was later re-printed and updated with a second edition. Full color and black and white.